Remember Griffin, my fellow American Joburger who cruises the streets selling books from a suitcase? Well, he’s not just selling from a suitcase anymore. 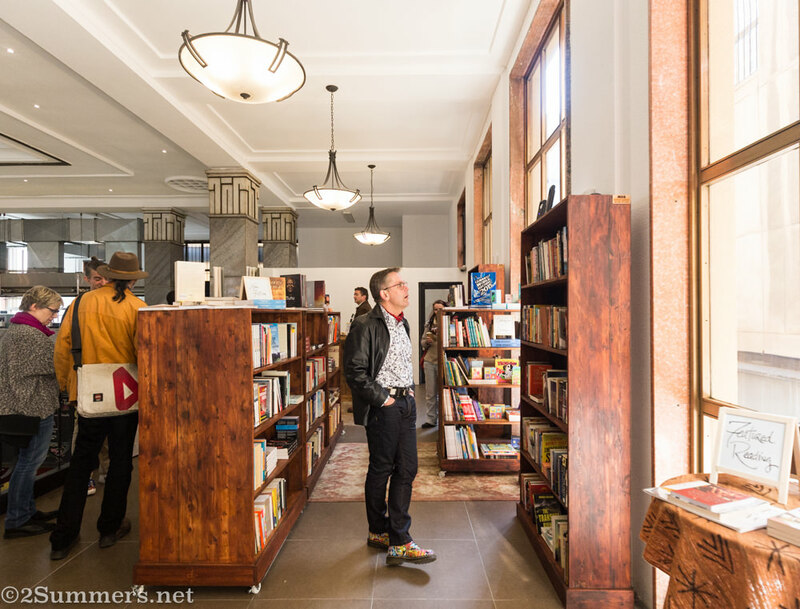 Griffin now has his own bookshop, Bridge Books, right in the middle of downtown Joburg. I visited the shop last weekend and it’s awesome. 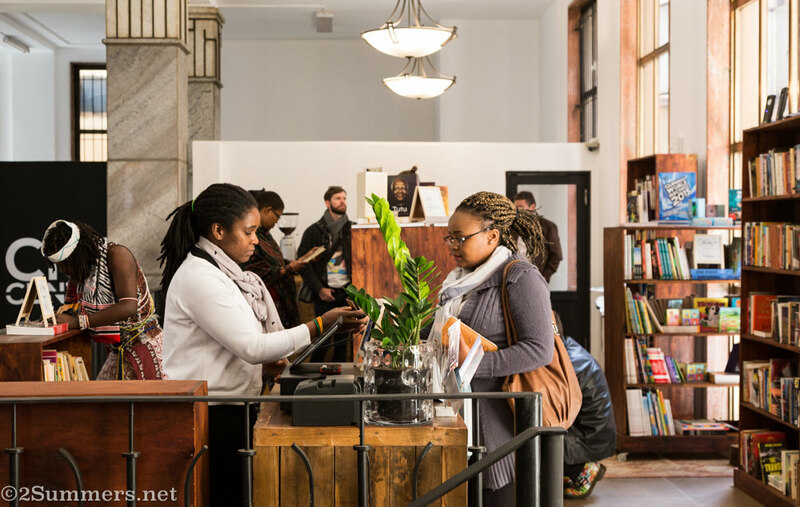 Bridge Books on its opening weekend. I love this guy’s shoes. I am so excited about this shop. It’s on one of downtown Joburg’s most iconic streets, Commissioner Street, just around the corner from the Johannesburg Public Library. 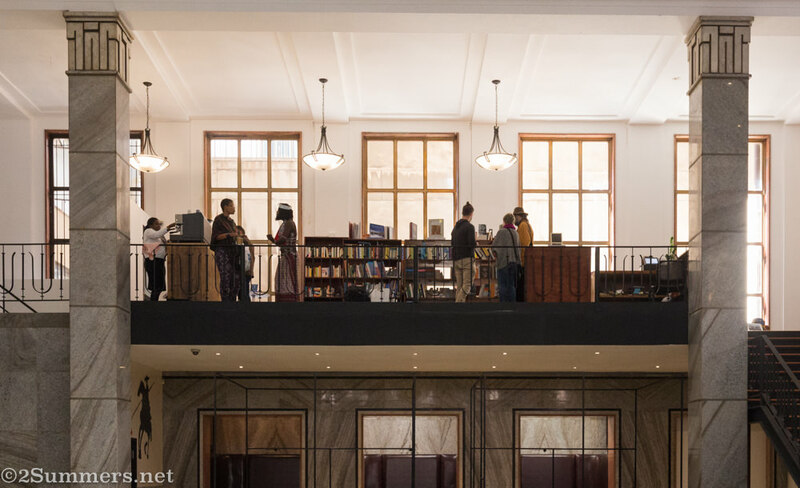 The shop is located in a beautiful building, 85 Commissioner Street, which used to be the headquarters of Barclay’s Bank and will soon house a trendy food court (to be called the City Central Food Hall) and a high-end restaurant. This is an exciting, historic, and very safe section of downtown Joburg. 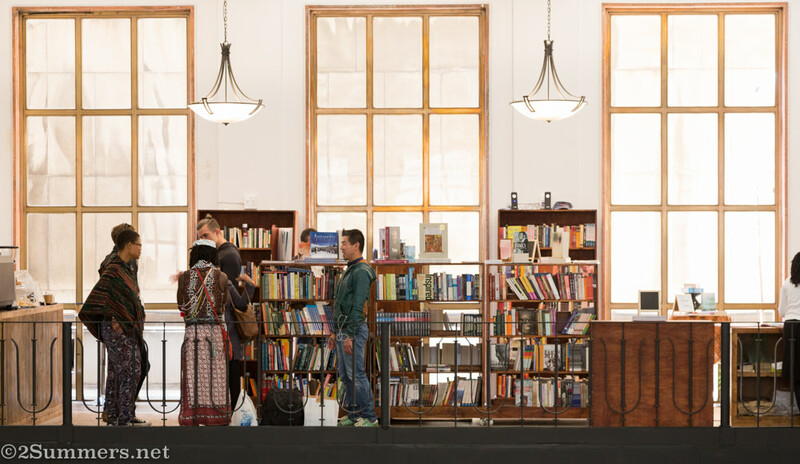 Bridge Books is on a balcony overlooking the ground floor of the building, with floor-to-ceiling windows and great light. Looking up at Bridge Books from the ground floor. Looking at Bridge Books from the balcony on the other side of the building. My friend Veronica (left), who works at Bridge Books, ringing up a sale. I was too shy to talk to this man dressed in fabulous traditional attire. But I’m told he is an author named Unathi. I saw him signing someone’s book. 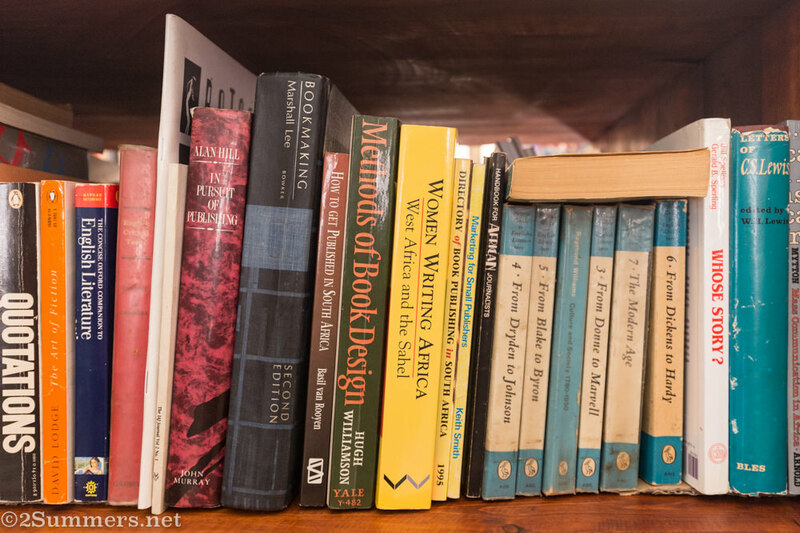 Bridge Books has an amazing selection of new and used, mostly African books, at great prices — much cheaper than those sold at mainstream bookstores in the Jozi suburbs. 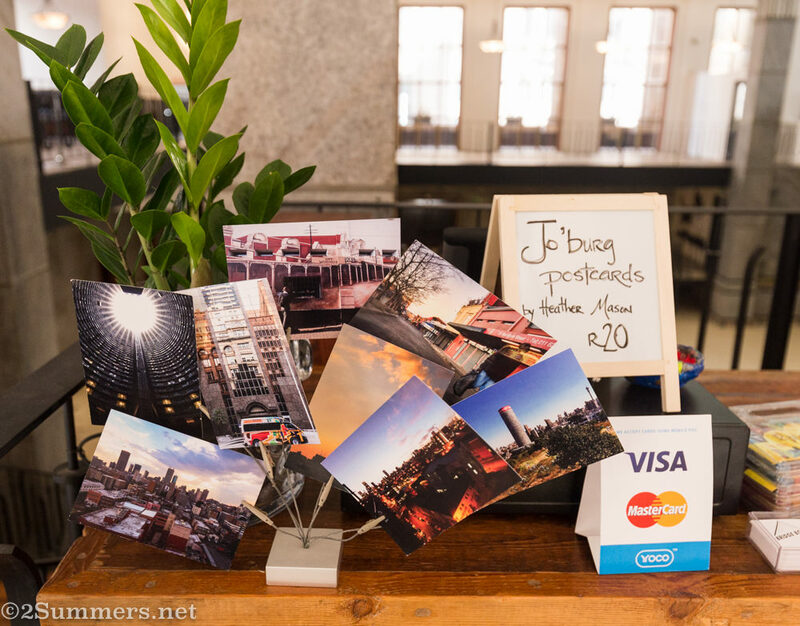 Perhaps best of all, Bridge Books is selling a series of Joburg-themed postcards featuring the photography of…me. I even witnessed an actual person buying two of my postcards. I found this exciting. This is Deborah. 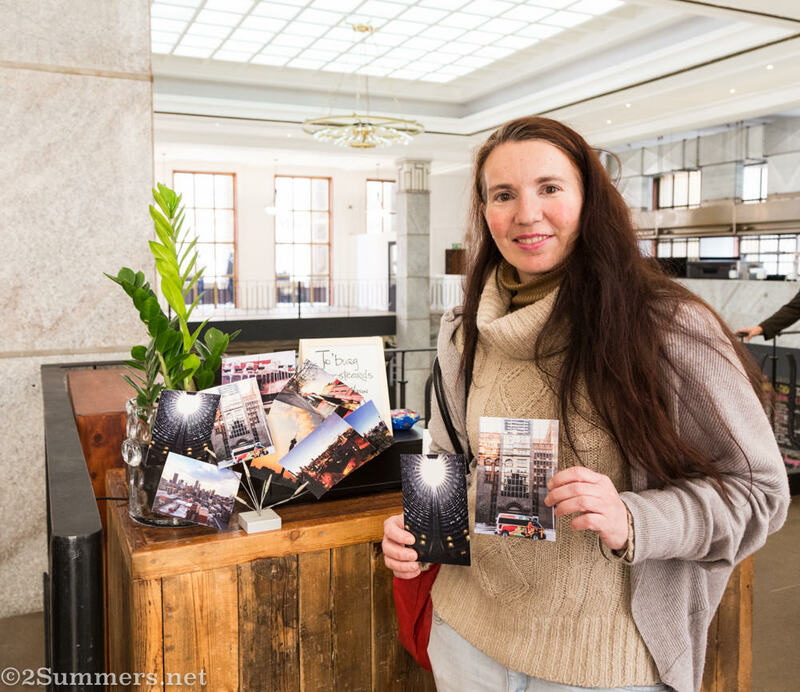 She bought these postcards to send to her family overseas. When she realized I was the photographer, she asked me to sign them! This might be the first time, other than at the SandtonPlaces book-signing, that someone has asked for my autograph. Seriously though, you should go, and not just to buy my postcards. (Although you should definitely buy my postcards.) Bridge Books is a great excuse to get into town and have a different kind of shopping experience. The shop also has an excellent coffee bar, selling single-origin coffee from Bean There. 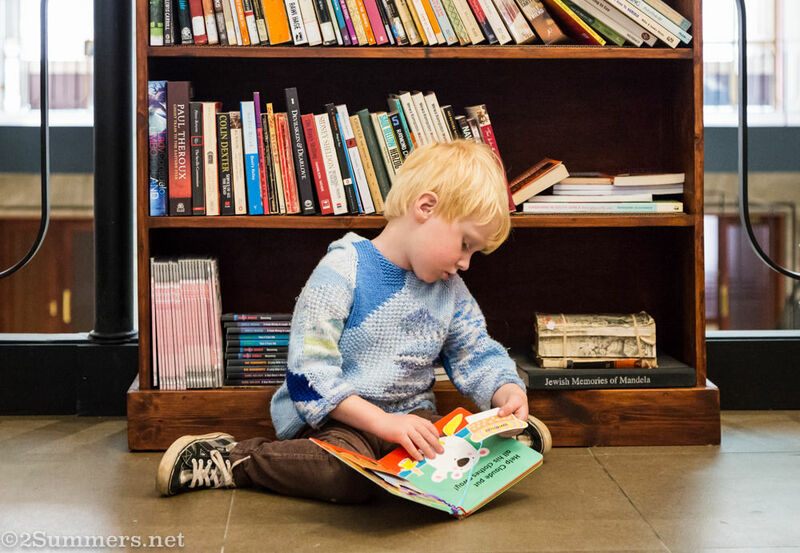 Little Theo likes Bridge Books and you will, too. 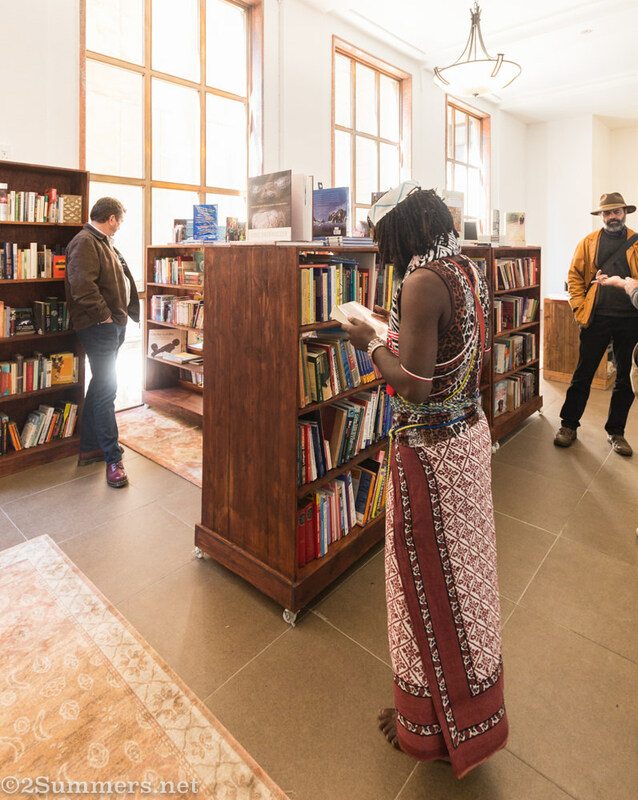 Bridge Books is at 85 Commissioner Street, between Harrison and Loveday Streets, right across from the Library Gardens Rea Vaya station. Ah, you have to go then. It will be a perfect lunch spot for downtown workers once the food hall opens. This is so exciting! and yay for your postcards H! Fantastic! A visit most definite! This looks awesome Heather! Must make a plan to visit (and buy some postcards!!). 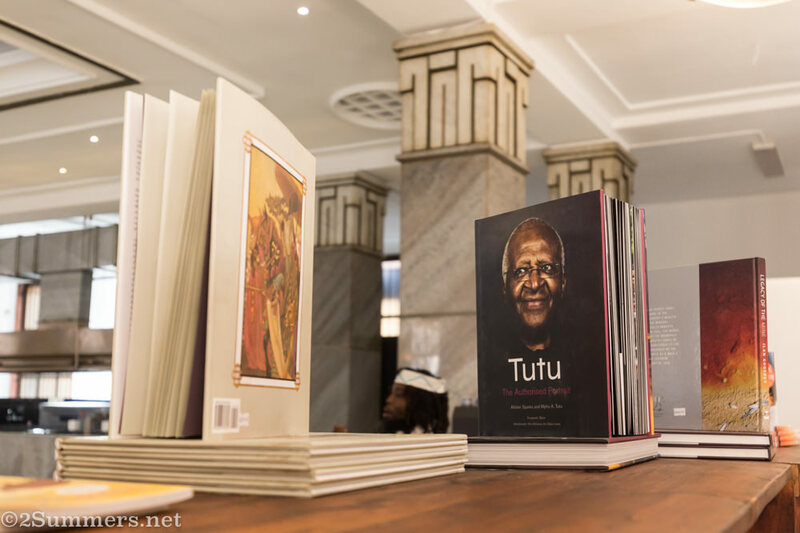 Am excited about this venture, I’m a fan already I love books. See you soon. Hello Heather, where else can I get your postcards please asides Bridge Books? Hi there, are you in Joburg? Either way, I have some postcards and we can figure something out. Please send me an email through my contact page. Thanks! Thanks for the response 🙂 I just did!